I think most can agree that the middle of April is a relatively somber and stressful time for Americans all across the country. But take a deep breath everyone... April 18th has come and gone. Tax season is over! (for now) The good news is that now that your tax returns have been filed you should be receiving a much-deserved return in the coming weeks. It is reported that by April 8th of 2016, the average return for taxpayers was $2,798.1 I'm not sure about you, but that would be a welcomed "gift" for all the stress of the past month! So, how do you plan on spending your return this year? How about upgrading your laptop? Let's face it, you've probably had the same tired laptop for a few years now and you are noticing issues with the LCD screen, keyboard issues or the battery life declining. It's widely believed that most laptops begin "aging" after about 2-3 years of usage. In fact, battery life is said to begin its' decline between 18-24 months post-purchase. Below we have outlined some of the better laptop options on the market ranked from the cheapest to most expensive. 2. Toshiba Chromebook 2 (List Price = $329.99): For those who are not as comfortable with the touch screen technology and enjoy the more traditional laptop setting, this just might be the device for you! 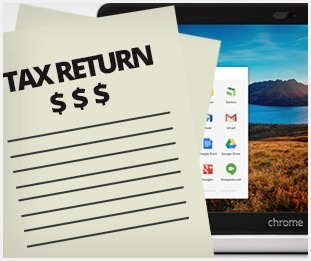 It is widely respected for one of the better screen displays among Chromebook devices. The screen is 13.3 in. and fully HD. It contains a more spacious keyboard that other models and has an excellent built in sound system. Now we get into a couple of the more expensive options (but not overly so) for those who are looking to splash some cash this tax return season! 4. Dell XPS 13 (List Price = $799.00): For anyone who has done research on laptops, you've probably read that this is one of the better laptops available on the market. This device is a very light laptop with an 11 in. frame. This product contains an average battery life of about 9 hours and has a state-of-the-art keyboard and touchpad. It's hard to find a much better option than this on the market! 5. Surface Pro 4 (List Price = $899.00): This product contains a larger screen with high resolution. This model weighs 1.7 lbs (which is the same as the Surface Pro 3). The biggest improvement from the last model is a new highly adjustable kickstand. The only knock on this product is that the 4 does not have much better battery life than the 3. All in all, this is solid laptop for consumers. Reward yourself this year! Go out and do your own research and invest in some of the best laptop technology on the market! And don't forget to make sure that your laptop is protected from damages with laptop insurance from Worth Ave. Group. We cover all manufacturers and models! Get your free quote today.